I got a few strange looks from people over the weekend when it was apparent that I was alone. I know that a lot of people can’t think of many things more horrifying than dining alone, but I actually really love it! I find that I’m really happy sitting in a cafe with my tea or meal, and a book or notepad or tablet to do some reading or writing in between bites of food and people watching. No, I’m not on my phone, I’m not texting or checking Facebook, I’m just enjoying MY time. My favourite places to enjoy this time alone are always tea houses, so you can imagine how excited I was when I arrived in Warburton and saw a sign hanging over The Old Tea Shop, boasting over 200 tea blends. And another sign promising not only freshly baked, but gluten free scones! Done deal! The Old Tea Shop was the place dreams are made of for premature nannas like me; beautiful tea sets all around, the smell of fresh scones baking, and a wall of tea that stopped me in my tracks. Not only can you take any of the teas home with you (or order online! ), you can also select any of the teas on display to enjoy in store (the best way to do this is to open every jar and smell them all). After MUCH deliberation, I decided on a pot of the almond and vanilla black tea, which was incredibly good; just enough almond flavour to know what you were drinking, subtle enough nor to taste funny. I also took home packages of sticky toffee, macadamia and French Earl grey. So the teas are fantastic. But let’s talk about the gluten free scones for as moment; can it be done?? Can they honestly, truly be made to be soft and delicate and buttery and delicious if they’re gluten free? In a word, yes. I’d never have believed it if I hadn’t tried them for myself, but the scones here are delicious! While they’re not traditional scones (more like a scone/cupcake hybrid, they are beautiful. Lighter and fluffier than you’d ever believe possible for a gluten free item, they’re the perfect little accompaniment to your pot of tea. 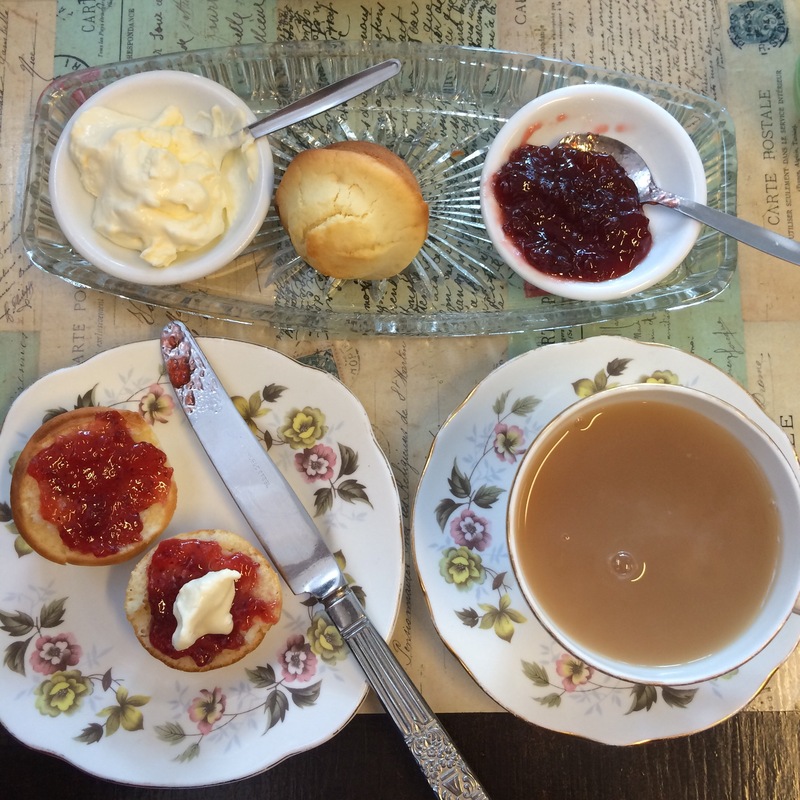 This is a place that tea lovers in Melbourne should visit; the tea is amazing, both in variety and quality, the service is the friendliest in town, and they cater exceptionally well for special diets! And if you can’t make it down to visit, do yourself a favour and check out the online store! Eat Here! (food reviews), Eat Here: Brunch, Eat Here: Desserts, Eat Here: Melbourne eateries, Tea time! How wonderful! I love Warburton. I also travelled alone interstate when I was young and the looks sure are weird! I really want to go back to warbuton after reading this btw! Us weird women leaving our other halves to enjoy some solo time! Hehe 😉 definitely worth another visit though, especially if it’s been a while since your last one! Looks like a lovely place. As long as I have a good book, I am happy to dine alone, or do anything alone. Books are good company. Pingback: 10 teas I’m drinking this winter | Eat. Travel. Blog. Pingback: Eat here: Little Joe, Warburton, Victoria | Eat. Travel. Blog.